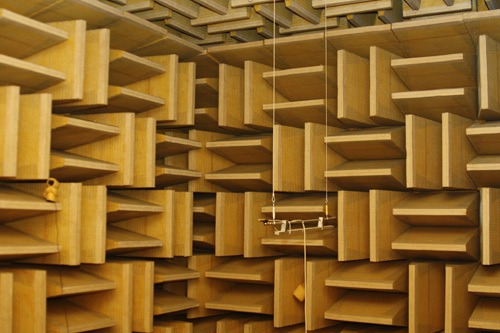 Axiom's Anechoic Chamber. See pictures of the building of the chamber at Axiom. Axiom's anechoic chamber is pretty much a direct copy of the one at the National Research Council (NRC). In fact we ran calibrations between the two to ensure they were identical. Our anechoic chamber is certified anechoic down to 85 Hz (below this it is off to the tower for design work) though we have written a series of correction curves from our tower measurements to make each model we are working on accurate down to 10 Hz when measured in the chamber. The microphone is a B&K measurement microphone, the industry standard, and from our experience and absolute must to ensure accurate measurements. We have a second one of these microphones which is used on the tower and for various in-room experiments we run.